I won my first game to Jamie Fuller of Berkshire 3-0, then unfortunately drew Dorset youth captain Carl Beattie who was staying with us in our caravan, beating him 3-0 as well. I then played Alan Bond of Middlesex and narrowly beat him 3-2. I then played a tough, tough opponent and a good friend Mark Cairney beating him 3-0 taking me into a game again Stephen Bunting in the group final. At 2-1 down I had one dart at tops to take it to 2-2, and missed with Steve shooting out on 74, leaving me with a 3-1 exit. Last 32 though and was happy with the points. Also I had a mini-bus load of guys to come down from St. Ives club to watch me. All turned up in pink shirts, thanks for doing that guys, it made it a very special day, and it was lovely to have your support. 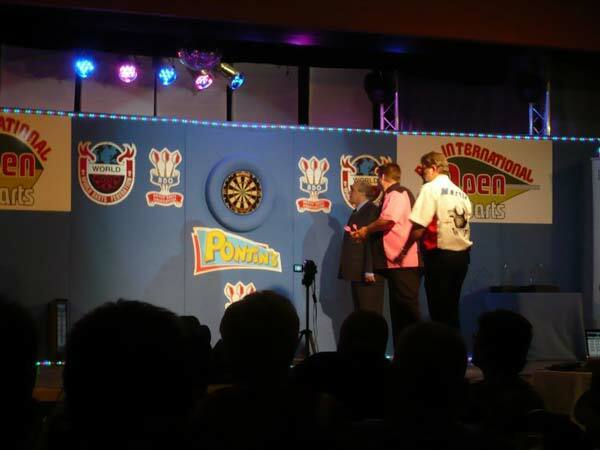 In the pairs I played with Paul Carter, and we lost in the semi-finals to Ronnie Goodbeer and Mark Harris 3-2. All in all a very good month for me. Picked up a lot of points filling more boxes for me, settling me down a bit, enabling me to just play each game as it comes. The day before the pentathlon I was opening the local village fete, held at my Primary school, less than a mile from where I live. This is the kind of thing that keeps me close to home, and seeing all the local village people and my old primary school friends keeps my feet on the ground. We then headed down to have the usual dinner date with Sally and John Walton. I finished 5th in the Pentathlon, 6 points less than last year, showing the standard had gone up this year, which John boy Walton turned over Martin Adams to win it. It's a really great day of darts and if you ever get invited, make sure you take up the offer. This is one we always do as a family. Most of my Dorset darts family are always there too. We got down late on Friday evening as Katie had an exam. Unfortunate thing was that Pecker Woods was only 2 doors up, so getting wise arse remarks every time he walked past. Saturday morning, played in the mixed 3's with my kids. Never been so nervous whilst playing darts in all my life. When they leave you a double they expect you to get it! One series of throws, I threw 45, Katie threw 125 and Sam threw 100 and then walked back to me saying, buck your ideas up, or we'll find a new partner! We got through the 1st round but lost in the second round. Mixed pairs I played with Steph Smee, and we lost in the last 16 to Paul and Caroline Carter, Dorset team mates. In the evening, we headed to Rich Perry’s chalet and the Dorset area to watch England Opening game in the world cup. We know about the Rob Green howler so I won't go any further on that one, so it was an early night ready for the singles on Sunday. I had London Lewis McGurn 1st round and beat him 3-0. I was down for a bye and due to play an hour later, and somehow then had to play Lewis. Which I feel is a bit out of order and John Hendo had the same, having to play Conan. Second round I then had to play young Dutch star Rico Dera 3-0. I then played slim Steve Moran from Chesire, after him going 1-0 up, I got it back to win 3-1. 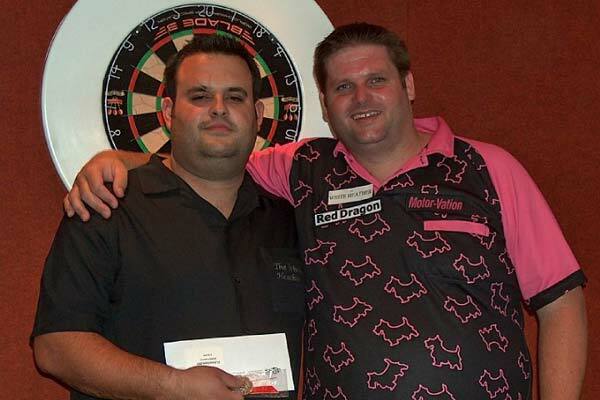 Next was David Neads, a good darting character, been around a while and always going to be a test for anybody. The Welshman went 2-0 up for which he then had 2 darts at tops to win the match. I was able to come back and win this one 3-2, we all have to play your get out of jail card at some point, and this was probably the one I thought. I then beat Devon's Mark Kneebone 3-0 to win my group. Now I had guaranteed points it was time to settle down. Group 5 winner was Jamie Robinson, and I knew I had a tough one against him as he'd just beat Stephen Bunting the game before. He went straight to a 2-0 lead where I played my get out of jail card again to come back and win it 3-2. This took me to the last 8 and the staged finals for the 2nd year in a row. I then had to play Martin "Wolfie" Adams, losing 2-1 with Martin playing his get out of jail card when I had 3 darts at double 9 to win the match. First weekend in June saw the Swiss open. 5th of June was also my 40th birthday, and for some unknown reason my sponsors thought it would be nice for me to take my wife! So they paid for her flight and hotel, all jokes aside, thanks to Gary and Cloey at Motor-vation Garage. Eddie White came with me on this one, and his mate Ian Craigie who is currently living in Switzerland. He picked us up from the airport and took us to our hotel, so thanks to Ian for that. 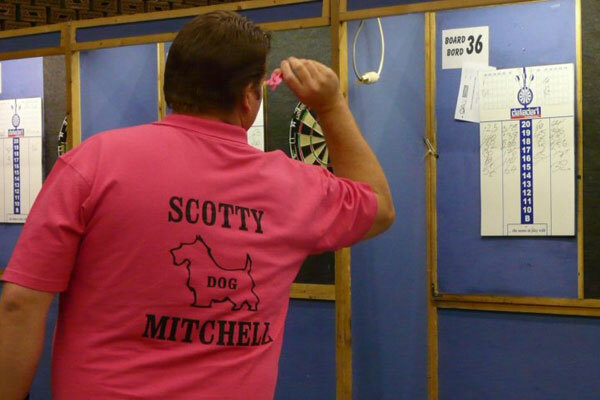 As for the darts, they went pretty well all weekend. I had a real tough run in the singles, beating Gaurdenz Coray 3 sets to 0. Then Dutchman Brauillio Roncero 3-0. Scraped over the line again Toon Greebe 3-2, sat at 1-1 in the last set, Toon having had one dart at double top to win the match, I shot a 131 to take the match. In the semi-finals I played Clive Bardon and with him 2 sets to 1 up, came back to win it, 3 sets to 2. In the final I then played young Dutchman Fabian Roosenbrand 3-1 after he'd hit 8 180's in the match, to my 3. He just couldn't hit a double. So on my 40th birthday was crowned the Swiss Open Champion for the second year in a row. Many thanks to the lovely Swiss ladies who made me a lovely 40th Birthday cake, which after the final I cut up and players that were still there all got a slice. Unfortunately Eddie White lost in the last 16, 3 sets to 2 to finalist Fabian Roosenbrand. I then celebrated with my birthday meal in McDonalds costing about £28 for 2 happy meals, but I was happy. Following day Eddie and I paired up, eventually losing in the final to Robert Wagner and Fabian Roosenbrand 3-2. Crowned Swiss Open 2010 champion. I headed to this one with county team mates Eddie White and Lorraine Woodrow with Paul not attending this one. Eddie and Lorraine had not been to anything like this before and were rather excited. So when we headed to the pairs on the Saturday and I had got the wrong start time I thought here we go. It is just going to be one of those weekends. We left disappointed but not despondent. We got back to my hotel and I was convinced I'd lost my wallet and Sharon was home on the phone to the bank to cancel the cards and Eddie came in and found it. So I thought that the weekend was not going to get better. Sunday arrived and we got the right time for the competition so we were doing well to start. Kev Simm was with us in the same hotel so would have blamed him if we had got it wrong. Eddie had got through a couple of matches playing really well but lost I think to a Dutchman with fair bit of support. I was playing at the same time and Lorraine had to chalk her 1st round walkover. Ed lost out narrowly but enjoyed the experience and I'm sure he will be back to do another. Lorraine walked into 2nd round match with Dutch starlet Sharon Prins. Sharon has come from the youth ranks and settled into the senior comps very well. So I knew Lorraine had a tough game. She ended up losing narrowly with a dart at tops to win. So we had a happy Lorraine who had played great. I'd started with 3 tough matches and in my board final played Stephan De Wit. This little guy was a great dart player. He hit 5 180s to my 2 in 6 legs and apart from a missed double he did nothing wrong in the match. He missed a dart at 36 to go 3-3. I won 4-2 and was very relieved to win the group and be in the points. I'm sure I will see this little fella again to. That put me against Tony O'Shea. I'd played Tony on the circuit before at German Open 2008 and had beaten him 3-0. I won bull up and went into a 3-0 lead with 15, 12 and 14 dart legs. Tony the class that he is hit back with a 12 and I finished with a 13 to win 4-1 win. I then went and got a drink and returned to have a practice on the board the quarter final would be played on. Braulio Roncero was my next opponent and he came to me and asked me to get off the board as he had to play Tony O'Shea and was I the chalker. I explained I beat Tony and he did not believe me. He asked again was I the chalker. So game started and his friend chalked the match. I got to 3-1 up and the tricks from him and the chalker started. Talking to each other and a few scores that were very dubious to say the very least. I questioned on 140 which had 2 darts that were a mile away from the treble 20 and the duster did not understand me apparently. The game went 3-3 and I missed 2 darts at 40 to go 4-3 and the win. Braulio shot out and I was done. Went to shake hands and was told it was best of 9. So I threw 180 1st throw to go which helped me go 4-4. I won the bull up and 12 darts later I had won 5-4 and he could not believe he had lost. Ross Montgomery had same problem with him and the chalker and I lost to him 4-0 in the Belgium open a couple of years back with a similar incident. So we know to look out for it now. Stuart Kellett I played the semi on stage. We were 1st semi-final so no prep time and we were on. I won the bull up and was at 2-2 in the 1st and sat on 40 with the darts and Stuart shot 160 for the set. So next set going with the throw at 2-1 down sat on 32 Stuart shot a ton plus to beat me 2 sets to 0. Stuart ever the gent said he robbed me and I felt he shot out much better so deserved it. Good points for me so really happy. Stuart went on to beat Gino Vos in the final. Stuart looks a cert for auto spot at the Lakeside so keep your eyes open for him as he a top lad aswell. We decided the kids would come to this and enjoy it just as they did at Lakeside. We headed up on the Friday and arrived at our hotel. John and Tracey came up too and can't not thank them enough to take the time to come to Bridlington to support me. This was to screened live over the internet so exciting for us as internationals have not been on screen for a few years. Saturday we watched again as we played on the Sunday both games again. Robbie Green and Stephen Bunting the big girls borrowed my spare shirt as they had ordered a size or 6 too small. They are so vain. We played Wales 1st and I had drawn out my old mate Peter Johns. Everybody in Dorset seems to have beaten Peter when we have played Gwent. We were having a good match and it was at 2-2 and we started to respect each other. Peter missed darts to win so nice like I am so did I and then knew Peter would not miss again and he didn't. I had 26.96 ave and he had 26.56 so nothing in it. Peter went backstage with me and we had a beer and a chat which is what its all about for me. England Beat Wales 8-4 in the match so we still had all to play for with the Scotland Match. I was fortunate to stay in the team for the Scotland game as I had highest loosing average. Steve Douglas the unfortunate player to drop so Andy Beardmore of staffs who had beat me the month before at county got the nod. Flower of Scotland bellowed out by the Jocks is something to see and hear. So as we sing our land of hope and glory and the Assassin gets caught holding the words for about 5 of us to read by the cameraman was quite embarrassing as he screwed the paper up and us !!!!! I had Steve Ritchie in this one and he was a new cap which I well remember from the year before. Steve had a good game the day before so this was gonna be tough. He flew out the blocks, just as I thought he would. Scoring was incredible and I was just was trying to hang in there. I got to 2-1 up and flew myself in the last leg but after 2 darts at tops missed I'd felt Steve would level. He pressured the shot and I hit the most awkward double 10 with my last dart of my life. I was just so relieved. I won 3-1 with a 29.96 but Steve had a 31 which is just brilliant. It was the point that won the match but you can't think of that when you go up there. 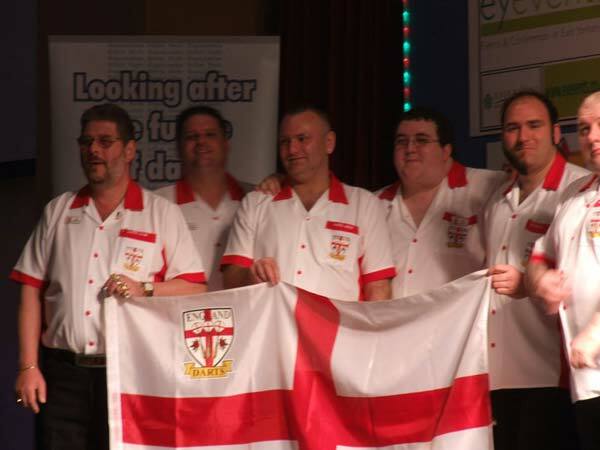 England won the British Internationals for the 2nd time in a row. It felt great. You still feel for your mates on the other team. The Ladies won as well making it a double for England. I know Gary Stone of Scotland and Jamie Lewis of Wales as 2 mates who also made their debut this year who played so well. These Gentlemen along with Steve Richie I'm sure will have more of these Internationals to come. It is strange to watch my son Sam telling England lads how I snored the night before sat round a table with them like he has been there doing it for years. I'ts such a family atmosphere there and that's what I will always love about the Internationals, Scotland, Wales or England it's a great friendly weekend. Unfortunately I didn't make it to the German Open because of the ash cloud from the volcano!